We are so excited to announce the launch of the Green Phoenix Farms Aquaponic CSA, and we want you to be a part of it! 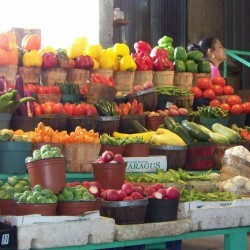 tomatoes, peppers, eggplants, cucumbers, melons and more. Along with the weekly produce, you will receive weekly recipe suggestions to help you use your harvest bounty, or we’ll offer suggestions on proper storage. Our goal is to produce some of the freshest “better than Organic,” chemical-free Aquaponic produce available anywhere. Each weekly share will be available to you within just a few hours of harvest! To read more about the details of the CSA program, you can do so HERE, and if you would like to fill out the Member Application you can do that HERE. **** SPECIAL OFFER **** We are opening the Membership Application with 50 available spaces for our inaugural Fall Season (September – November). These first 50 members will receive a complimentary Green Phoenix Farms t-shirt, and will also receive free bonus shares from our Summer Production as we ramp up to full production! Enroll now! Hi I am interested in the CSA – But I don’t want to sign up with Google! How else can I sign up, can you send me the form?